Founded by Captain Jake Tiller, Tiller Boatworks, operates in the spirit of keeping things simple and reliable. Our services are straightforward and customizable whether you need one-time help or ongoing support. Tiller Boatworks allows boat owners to enjoy their vessels without the pressure of cleaning, maintenance, stocking, and delivery needs. Whether you are a busy professional with limited time or perhaps live out of town and cannot take care of your boat regularly, we have affordable service packages for you. We service the greater Tampa Bay waterways with a much broader range for deliveries. Captain Jake Tiller grew up on the coast of South Carolina, sailing his 16 foot Prindle Catamaran around Hilton Head and surrounding Islands. As a teenager, Captain Jake Tiller would spend the summers in the Ocala region of Florida. Always gravitating to water, he learned about sailing and boating in Florida coastal and inter-coastal waters. In high school and college he worked as a Lifeguard and Surf Patrol teaching safety and performing rescues in the Atlantic Ocean. "Boating has been in my blood since I was a child sailing by myself off the coast of Hilton Head Island, South Carolina where I grew up. Everything and anything with boating is my passion, from keeping boats in tip-top shape to offshore delivers or moving boats from A to B." After graduating from Georgia Southern University with a Bachelor of Science in Recreation, Commercial & Resort Management, he was offered an opportunity to go to Hawaii to drive boats. He also is certified by the U.S. Coast Guard as a U.S. Merchant Marine Officer 100 ton with Sailing and Towing Endorsements. Captain Jake Tiller spent the next 17 years captaining commercial sailing charter boats and managing private boats in the Hawaiian Islands. Unlike the relatively calm waters of the Gulf of Mexico, this gave him experience in blue water sailing. 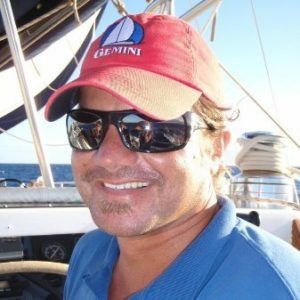 With years of experience sailing tours with 50 to 60 foot catamarans, he became well known in Hawaiian boating and sailing communities. This led to contracts to move vessels from different island ports and also several long distance vessel deliveries including an almost 8,000 mile voyage to deliver a new 65 foot sailboat from St. Croix, US VI to Hawaii. In 2016, Captain Jake Tiller moved to the Tampa Bay area where he was approached by boat owners needing help in caring for and moving their boats. Recognizing a need, he launched Tiller Boatworks, as a resource to local boat owners who crave the adventure of boating and sailing, but have limited time for the maintenance demands of boat ownership. "Captain Jake Tiller, in my opinion, was the best captain on Maui. A few of Captain Jake Tiller’s strongest attributes:"
Please visit our services page to learn about our Vessel Management and Delivery Services or contact Captain Jake Tiller, at 727-490-9672, to discuss how Tiller Boatworks can fill your specific boating and sailing needs.